The lock screen of the Android phone is the screen that appears when we first wake the phone. It lets us unlock the phone using pin, pattern or password. With time, Android has improved this screen to offer time and notification data. But there are lots of lock screen apps that make lock screen of the Android phone even better to make you more productive. Now you can get access to weather, news, reply to notifications and more. The default lock screen is available to every smart mobile. But, in order to access more features, we need to install a good lock screen apps. 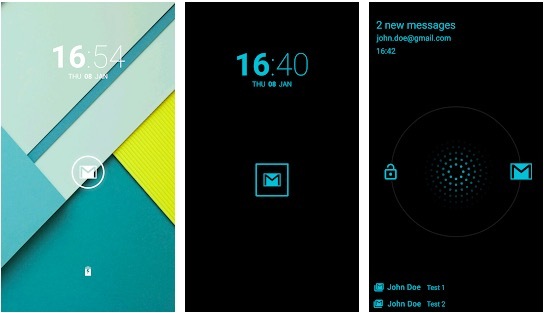 In this post, I will introduce you the best lock screen apps for Android Device. I am adding a long list of lock screen apps for Android. 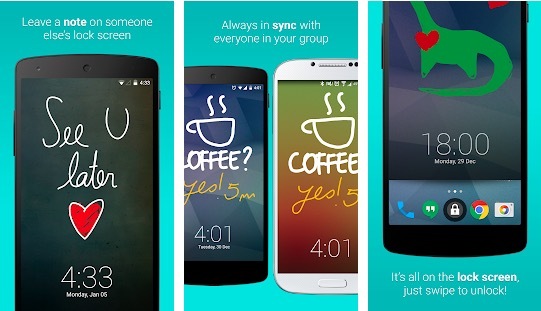 You can use any of these lock screen apps depending on your choice. 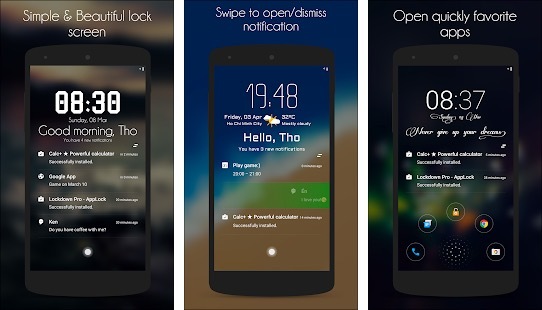 Here is the list of best lock screen apps for Android. This lock screen app gives you the way to access notifications on the locked screen itself. You can check notifications of Gmail, Facebook, WhatsApp and more right from your lock screen without the need of unlocking it. You can even set the background image and install many themes. It allows you the set the number of notifications to be shown on the lock screen. When you are done with looking at notifications and taking necessary actions, you can just swipe it to the left to make notifications disappear. If you want to dismiss all notifications at once, you just need to swipe down on the screen. It also has the clock as a built-in feature. It is available for free of cost. 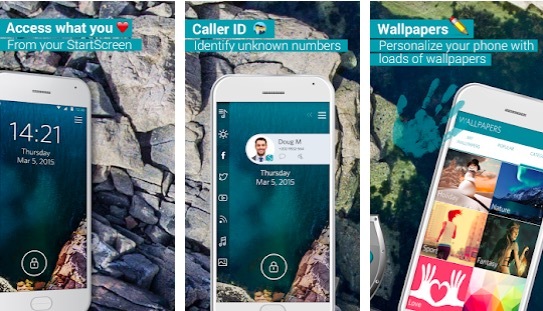 CM Locker is one of the popular lock screen apps for Android that aims to offer better security. The app protects your confidential data of your phone. 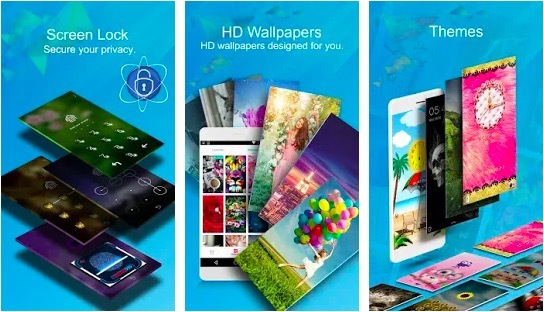 It also comes with awesome HD wallpapers, themes and password modes for using at the lick screen. It also offers Anti-Theft Protection, so it can help in locating your lost phone. It also captures selfie of anyone who tries to unlock your phone by entering the wrong password. The photo of the intruder will be sent to your e-mail instantly. The app also lets you control music from the lock screen. You can also access new messages and even reply directly from the lock screen. The app is small in size and offers good features. Hi Locker is also one of the best lock screen apps for Android. The app comes with customization options and doesn’t put much load on the battery. 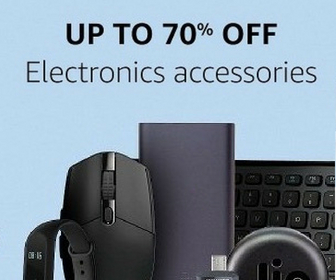 It comes with 3 unlock style and also supports Fingerprint sensors on many devices. You can customize the look and feel of lock screen as per your interest. It also shows random wallpapers from Flickr to keep the lock screen refreshed. You can also get weather information on the lock screen if you want. This application just lights up a little to show notification of your missed calls and received messages on the lock screen. This also shows the notifications of received emails and messages on other social media sites. You can set your photo as the background image. It allows you to share the screenshot of your lock screen with your friends, Facebook, Twitter and more. An important feature of this app is, it does not light up when your mobile is in your pocket. This is to avoid any accidental situations. It is available for free of cost and if you are a premium member you will get additional features like hiding sender’s name and number in the notifications, activating night mode and many other features. It also provides the options to change the icon of the lock to be shown on the screen. 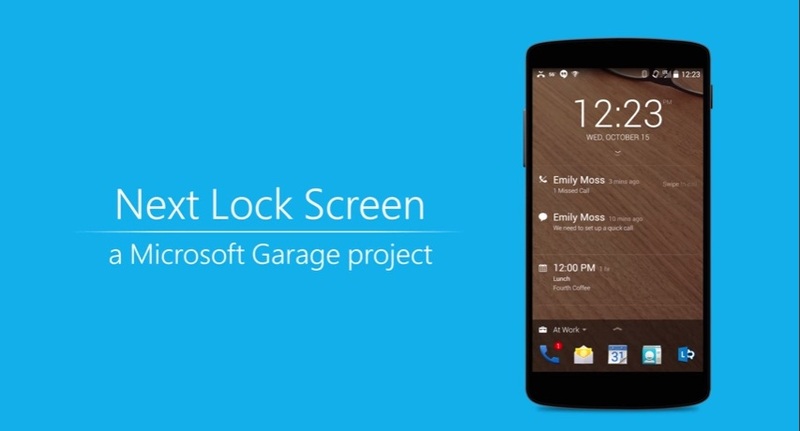 This application is a Microsoft Garage Project. It lets you see all your calendar events for the day, messages, missed calls and more on the lock screen itself. It’s most important feature is, you can attend the conference call by just tapping the lock screen itself. Mostly used apps can also be surfaced on the screen; so that you will have access to them even the mobile is locked. You can change the background image based on your interest or based on the location where you are. It also allows users to set the timer for notifications to be seen on the screen and to disappear after that particular time. It is available for free of cost. 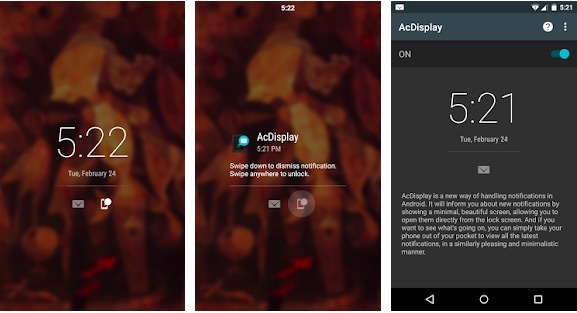 AcDisplay is a simple lock screen app that uses a minimalistic approach. It adds Ambient display like option on any Android phone. It has an active mode to wake your device. It shows new notifications on the lock screen and lets you open them directly from the lock screen. You can also enable dynamic background, block an app from sending your notifications, and configure more things. It comes with several background options. LokLok is another interesting lock screen app for Android. You can leave notes, drawings, and photos on the lock screen. It is like a shared whiteboard but useful only if your friends are also involved. You can create a group of people who will be sharing the same lock screen. You can write or draw something and it will be shown on all those people’s lock screen. Semper is for learners who want to learn something valuable. The app asks you vocabulary questions when you try to unlock the phone. If you do not know the answer, you can still access your phone anyway. 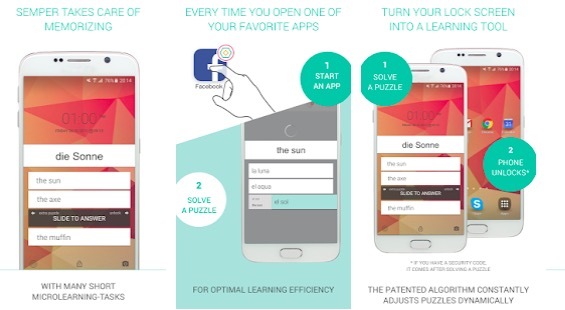 With time, it increases puzzle difficulty to maximize learning. The app offers more than 50,000 packs for over 50 languages. So, you can learn more than 50 languages. Floatify is also a good lock screen replacement app that actually looks like the stock lock screen of Android. You can add things like notifications, weather, and other data as per your interest. The app has model features like chat heads, themes and turning the display on when you pock the phone. The app lets you send a reply to messages directly from notifications. It also offers music controls on the lock screen. Start is also a good lick screen app you shouldn’t miss. It offers easy access to news and content source. You get easy and intuitive navigation. There are various password locks, widgets, news, weather, app shortcuts and more. It also includes little quizzes you can take to pass the time. The app is free to download and use but it contains ads. 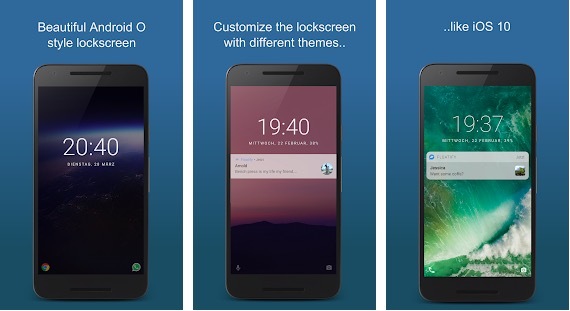 These are best lock screen apps for Android Device. Install them in your device and protect your important files and documents. Its additional features of accessing messages and calls from the lock screen are very useful. Hurry up!